Join us at the Expo, March 13, 2013! 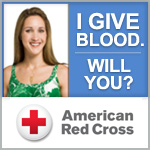 Members of the Carolina Blood Drive Committee will be manning a booth at the 2013 Work Well, Live Well Expo on Wed., Mar. 13, from 11 a.m. until 2 p.m. in the Rams Head Recreation Center. We will have information on the blood drive and how you can register to give or volunteer. Hope to see you there! This entry was posted in Summer Blood Drive on March 3, 2013 by Lynn Eades.